I have a confession to make: I have been writing for this blog for 5 years and in that time I have dispensed countless advice about home security. All great advice based on what I’ve learned from my colleagues and what I’ve read in the news and in the wider security industry. I have urged people to be proactive and not wait until they experience a break in before taking security seriously. But did I heed my own device? Well, I did and I didn’t – here’s what happened. Earlier this week I received a call from a neighbour, at 6.30 in the morning, to say that my garage had been broken into. I found that the ‘up and over’ door had been forced open and all our bikes had been taken. I’ve actually written blogs on this specific subject so I know all the things I could have done to prevent a break in but I didn’t do all of them. I will stress at this point that the garage was locked but I had failed to realise how easy it is for standard garage doors to be forced and I thought that was good enough. If I had followed all of my own advice, I could have secured the door better and I could have protected the bikes inside better, even if they had got through the doors. Isn’t hindsight wonderful! I now have our locksmith coming out to fit extra locks on both the main door and the side door; in other words, shutting the garage door after the bikes have been burgled! The first obvious bit of advice is to lock your garage up and while that is definitely what you should do, it may not be enough. Most ‘up and over’ garage doors are quite easy to force open, even if they’re locked. They can be bent out from the corner or the locking mechanisms at the sides can be sprung by forcing a tool in down the sides of the door. We would recommend that you install deadbolts on each side of the door at the bottom. These go much deeper into the sides of the garage and prevent the door being opened, even if the main lock is damaged. Also pay attention to any personnel doors and ensure that these have anti-snap locks fitted, just as you would with your house doors. It never hurts to be too careful so if you have individual items that are valuable, such as bikes, secure them inside the garage. This could be locking several bikes together so they are too difficult to move, or ideally lock them to something that can’t be moved such as to the wall or to a heavy item within the garage. Even if they attempt to get through this second set of locks, it will significantly slow them down meaning more opportunity for them to be disturbed. In reality, most will give up at this point. If your garage has power, and therefore lights, then windows don’t really serve much purpose except to make a garage more vulnerable. 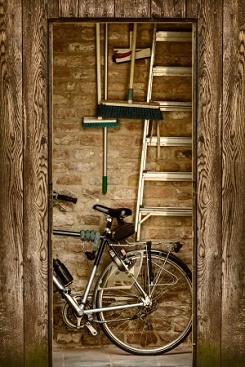 Not only can a burglar look inside to see what you have but they can be broken to allow access. At least cover them from the inside but ideally block them up so they can’t be used to gain entry. If your garage is at the end of your drive, you could even park as close as you can to the door so that there’s no room to lift it up, effectively blocking it. Did you know that garages can easily be added to many house intruder alarm systems, even if it’s not physically connected to the house? It can usually be added as an extra zone with door contacts and sensors. You can even set it independently of the house system so that the garage zone is active even while you’re still pottering around the house in the evening. Motion sensor security lighting is a good idea as many burglars want to keep as low a profile as possible. Most will give up rather than work under a spotlight. It’s much better to prevent a break-in than have to deal with one (and then have to take all these measures anyway). Do these 5 things and something that started as an easy job for an intruder has just become significantly more difficult. Even if you don’t keep anything valuable in your garage, damage to doors and windows from forced entry can be expensive to repair. For more information on garage deadbolts, anti-snap locks and adding alarm zones call us on 0800 612 9799 or come to our shop on Roundwood Industrial Estate in Wakefield, near junction 40 of the M1. previous Engineer Andy is our “ray of sunshine”! next What is a monitored intruder alarm?